Eaton offers a full range of innovative, reliable surge protection solutions to protect against the damaging effects of lightning, utility switching, switching electric motors, and more. Watch this Video for more information. A homeowner can help protect against such damage with a comprehensive approach to surge protection. Eaton’s surge suppression products offer the homeowner a complete approach, by offering both Stage I and Stage II surge protection. 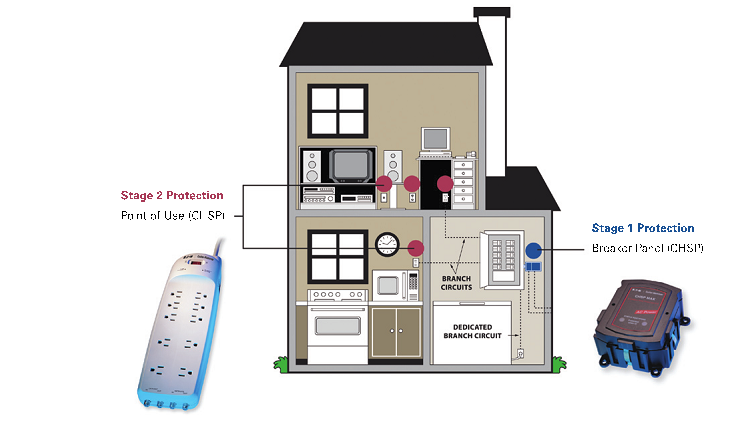 Stage 1: Service Entrance Protection is designed to provide premier surge protection for AC power, telephone and cable at the point of entrance to the home. Protection at this location can reduce surges to an acceptable level for surge strips to handle at the point of use. Stage II: Point of use surge strips are designed to offer premier surge protection for specific electronics while providing innovative features to enhance user convenience safely. Eaton’s PSPD series of surge protection devices ensure that critical equipment is protected with the safest, most reliable and most advanced UL 1449 3rd Edition certified surge protectors. The array of features, options, and configurations ensures there is a unit for all electrical applications, including service entrances, data centers, critical distribution switchboards and panelboards, and PDU’s and RPP’s. Eaton’s PSPV series is a commercial grade and light industrial surge protection device that combines surge suppression components and EMI/RFI filtering to provide effective protection for sensitive electronic loads. Use of the PSPV can prevent costly downtime and equipment damage from surges (or transients) caused by lightning, utility grid switching, switching of external/internal inductive or capacitive loads and other sources.